In July of 2007, after walking many miles in the city, I launched Walking Off the Big Apple: A Strolling Guide to New York City. Engaging my interdisciplinary interests and background as a former student and teacher of American Studies, I started writing many themed posts on various figures in New York arts and letters - Greta Garbo, Georgia O'Keeffe, Sylvia Plath, Henry James, Raymond Hood, the Marx Brothers, among many others, as well as walks centered on fictional characters like Holly Goligthly, Lily Bart, and Mame Dennis. I also struck out to many parts of the city I had not yet explored. Since the early days, Walking Off the Big Apple has expanded to include posts on literary history, urban planning, architecture, neighborhoods, the waterfront, and the visual arts. Many of the posts are linked to an idea, as I think walking stimulates philosophical questions. I'm after nothing less than the re-enchantment of the city. In the summer of 2018, I launched Sailing Off the Big Apple, a boating guide to New York City. I work as an editorial consultant for artists and nonprofits, especially here in New York City. Enjoy your journeys wherever you may live. For more about what I do, including artwork, see my personal website at www.teritynes.com. Best New York City blogs 2016 - Spotted By Locals. Top 50 Travel Blogs in North America - Cisionblog. March 2013. "As with all her walks, Teri’s crisp writing transports you – inviting you to walk alongside her. And what a brilliant walking companion she is. It’s impossible not to learn something." 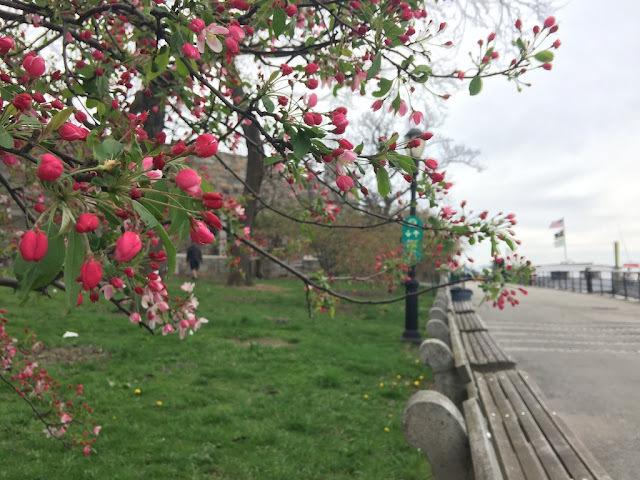 "Walking Off the Big Apple, a Web site that offers self-guided tours, is doing its part to help you see signs of life, with a listing of the best locations and blooming times for flowers and trees around the city. " "a great map-based collection of tours through New York"
"Wandering around New York City nearly always throws up some surprises, and at least is an enjoyable way of taking in everything it has to offer - if you disagree, Walking Off the Big Apple will set you straight and more than likely inspire you to go for a wander of your own." See my article from 2009 in The Times (London), The Bloggers' Travel Guide to... New York. "Walking Off the Big Apple: A Strolling Guide to New York City features several locations. With each one, you can look at a map, see pictures and read an overview of the things you'll encounter. Each featured stroll recounts the author's experience. You can spend all day getting to know the city this intimately. So, remember to bring comfortable footwear, water and a camera." One of 25 Best Blogs for Runners & Walkers - "Whether you live in New York City or are just planning a visit, you’ll appreciate this collection of guides to special walks around Central Park and the city." "fabulous blog that highlights the artsy side of New York City." "Planning a trip to New York this year? Perhaps you’re in town on business and have a few extra hours to enjoy the town between conference session? Walking Off The Big Apple is the perfect companion for your needs. The blog is a compendium of things to do when you’re in New York City. It features many self-guided walks are broken down by area and interest. You’ll also discover very useful tips for getting around, museum openings, and by neighborhood." "Walking Off the Big Apple is an ode to strolling the city's streets—a fabulous flâneur-fest. As pastimes go, it's perhaps our all-time favorite." Readers of TheBloggersGuide.com voted Walking Off the Big Apple as the Best Travel Blogger in North America. Walking Off the Big Apple was proclaimed the Best Travel Blogger in the world in the Times of London's own readers poll. Read Teri's article in the Times Online from May 13, 2009, "The bloggers' travel guide to … New York." "… after seeing Tynes’ blog I decided to jump into the blogging game. One day I hope this blog will look as good as her’s does." "Walking off the big apple has lots of great walking tour routes and ideas for New York City metro area hikes and so forth…"
"- Walking Off the Big Apple: encore un blog de fondu de New York, qui parcoure la ville à pieds, passionnant." "Walking Off the Big Apple blog (“A Strolling Guide to New York City”), handy and very well written– and photographed — whether or not you need quadricentennial information and musings." "... this site is just loaded with great ideas and information that I fully intend to put to good use as I walk this wonderful city. I mean, who can resist a list of bookstores and nearby cafes? Garbo walks? British Invasion Walks? Or a list of chocolate stores (ooh, Liz, this has your name all over it!)? Simply fabulous stuff." "Im Blog Walking Off the Big Apple gibt es eine schöne Auflistung von Buchhandlungen und Cafés." 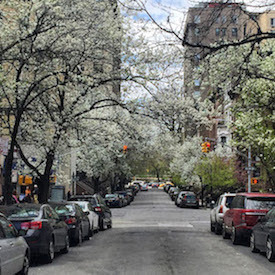 "On the site ”Walking Off The Big Apple,” blogger Teri Tynes has created a rather interesting strolling guide through NYC. Her walks tend to be literature, music, arts, and cinema focused with lots of ruminations on her subject matter. What’s great about her guide is that many of the walks will appeal to lifelong New Yorkers as well as tourists. I highly recommend her blog." "Para ideas de caminatas interesantes por la ciudad: http://www.walkingoffthebigapple.com/"
"She uses her fertile imagination and her historical knowledge to give her readers a new perspective on New York City." "Teri is probably the one single person who’s fueled my passion for New York more than anyone else and for this I consider her a true inspiration. However her literary passion, and her love of books provides further inspiration not just for me but for any reader." "Walking off the Big Apple is a guide to…you guessed it… walking NYC. The appeal of Ms. Teri Tynes’ (a NYC resident) blog is it’s real time and residential information. On an every other day average Ms. Tynes takes you on a detailed walking “tour” of local and tourist destinations. Ms. Tynes’ tours provide NYC historical information, maps, very thoughtful descriptions, and up to-date (real time) information (e.g. current local museum exhibitions). What is so appealing about Ms. Tynes’ blog is the fact that her tours allow us to feel as if we are living in NYC." Note: Walking Off the Big Apple does not accept guest posts. Ads for Walking Off the Big Apple are placed through Google AdWords.